President Trump on Thursday reversed himself on the issue of termination of Deferred Enforced Departure (DED) for Liberians and said “it is in the foreign policy interest of the United States” to give Liberians another year, until March 30, 2020, to stay in the United States. Last year, Trump shocked Liberians by saying that conditions in Liberia had improved and that DED will enter a one year “wind-down” period that was to end this weekend on March 31. 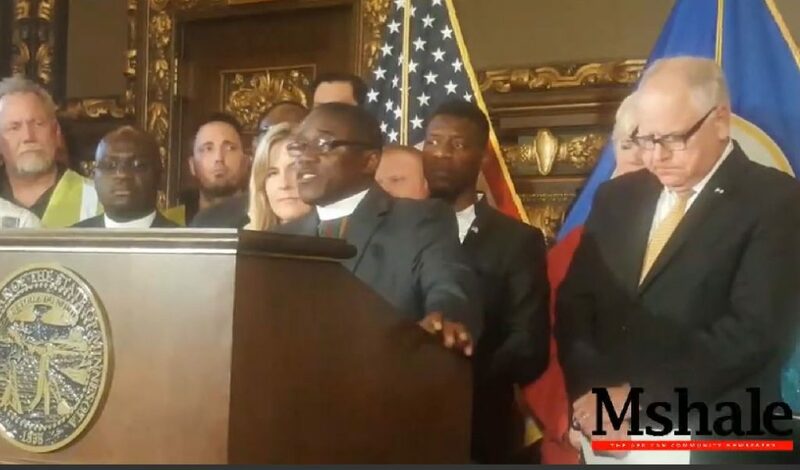 At a press conference at the Minnesota State Capitol following the president’s new extension, Minnesota governor Tim Walz, attorney general Keith Ellison and speaker of the Minnesota House Melissa Hortman praised the decision but called for a permanent solution to the uncertainty Liberians face each year. The press conference was originally scheduled to call on the president to extend DED for Liberians but was overtaken by the surprise announcement from the White House. Ellison on his part attributed the president’s change of mind to the amicus brief he filed in a lawsuit that was challenging the DED termination. You can view the press conference here.